Program Plus for dogs is a multipurpose treatment for fleas, intestinal worms and heartworm diseases in dogs and puppies. It kills fleas, flea life stages, hookworms, roundworms and whipworms found in dogs. These are suitable for all breeds and sizes of dogs. The film-coated tablets are administered on a monthly basis based on the weight of the dog. 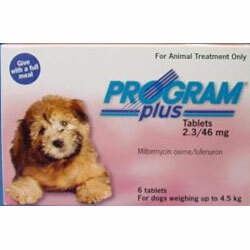 Program Plus for dogs is a unique scientific formulation consisting of Milbemycin oxime and Lufenuron. Milbemycin is a broad spectrum antiparasitic with anthelmintic, insecticidal and miticidal properties. Lufenuron is a pesticide that impedes the growth of flea larvae. Combination of both results in a full proof treatment for fleas and some intestinal worms. Administer on a monthly basis by giving directly in the mouth of the pet or mix with their food. 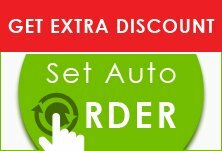 Repeat every month, if possible then on the same date. It is available in four different packs categorized as per the weight of dogs. My doggy was suffering from a very bad flea problem. Even after rinsing him from a flea shampoo I could see fleas all around his coat. My friend suggested me to try this product and it has worked wonderfully well. Now my furry pal is free from fleas. Now I do not buy any other flea preventive except program for my doggy. Thank you!!! This treatment is very easy to administer. It is perfect for those dog owners that are not able to use topical flea treatment due to loss of fur due to sensitivity. Highly recommended!!! I am happy that I have found this multipurpose treatment for my dog. It eliminates fleas, intestinal worms and heartworms too. Now my furry pal is healthy and free from pests and worms. We tried some of the cheaper products but never worked. This product really did the trick and exactly did what it's supposed to do. I am delighted to get this product for my loving furry pal.